Full size cooler with seven day ice retention performance! This is for one Brand New 150 Quart Cooler Huge Igloo Large Max Cold Chest 7 Day Ice Retention. 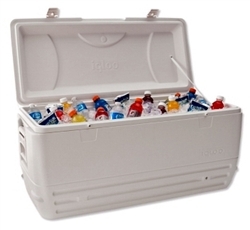 All-white UV protected cooler with extra wide, reinforced handles for added carrying comfort and durability. Great for camping, fishing, large parties and tailgating.